Halloween is right around the corner, and with it comes candy, lots of candy. 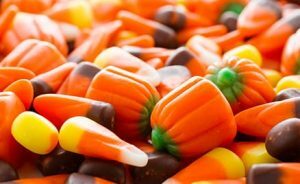 Americans will spend over $2 billion on Halloween candy this year alone. Unsurprisingly, much of that candy will contribute to trick-or-treaters getting cavities. You may be surprised to learn that not all candies are created equal in terms of causing cavities. Sugar has long been identified by dentists and oral health experts as a major cause of tooth decay and cavities. Naturally occurring bacteria in the mouth feed on sugar in candy and other foods and turn it into acid. This acid attacks tooth enamel and causes cavities. So how can you make sure Halloween candy doesn’t harm your child’s teeth? Read the tips below to find out. Avoid sticky candies like gummy fruit snacks, caramels, taffy, popcorn balls and other candies that expose the teeth to sugar for long periods of time. Choose candy that can be eaten quickly and easily to limit the amount of time sugar is in contact with the teeth. Dark chocolate is a good option. Avoid sour candies that may contain acids (such as citric acid) to intensify the sour flavor. These acids can contribute to dental erosion and cavities. Limit the amount of candy that is consumed in one sitting. Candy consumption should be followed by a thorough tooth brushing. Consider purchasing non-food treats for those who visit your home, such as coloring books or halloween toys.